Meisho Hills is an award winning, exclusive residential complex with 58 luxury townhouses ranging from 350 m2 to 903 m2 of total surface, built on a landscaped plot of 18,000 m2. Its spectacular setting and natural surroundings in one of Marbella's most prestigious residential areas known as Sierra Blanca, envelopes the ultra-modern architectural structure of the villas creating a sensation of distinction, luxury and unmatchable aesthetics. Set at the foot of the mountain and surrounded by the Natural Park of Sierra Blanca the complex offers both, secluded privacy as well as proximity to strategic locations such as Malaga airport, downtown Marbella, the famous leisure harbor of Puerto Banus and some of the best and most sought out golf courses in the area, all reachable within minutes. 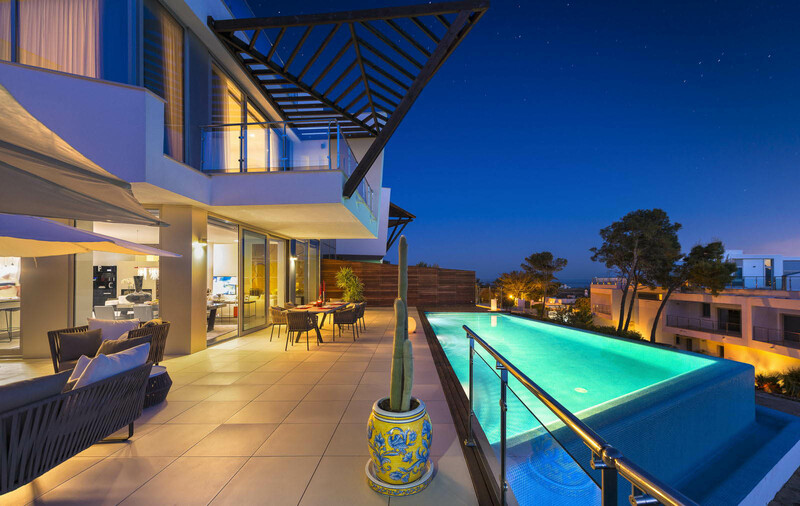 Breathtaking views overlooking Marbella and Puerto Banus, towards Gibraltar and Africa make Meisho Hills one of the most attractive locations on the Costa del Sol. The modern and innovative design of the complex, offers six different types of units, with two/ three or four bedrooms, each with an en-suite bathrooms and hydro-massage baths. All Townhouses have private garages for two to three cars and up to three storage areas/ which can be easily converted into a wine cellar/ cinema room/ gymnasium or anything desired. Some Townhouses have their own private lifts and swimming pools and large terraces with sumptuous lounge areas. The finest selection of materials has been applied throughout. Combining wood, stone and marble, with modern conveniences such as intelligent house systems, under floor heating, fully fitted bathrooms, fire place and air conditioning. The enclosed complex offers 24 hour security controlled with a closed video circuit. The magnificent onsite communal facilities include two large outdoor swimming pools/ three Spa areas featuring gymnasiums/ indoor swimming pools, saunas, Turkish baths and relaxation areas. The complex is settled in carefully landscaped gardens with ZEN-features, creating a serene and charming ambience. - Landscaping for rest and recreation, with two outdoor pools with a total area of 18,000 m2. Total area is 33,500 m2.